Today marks 6 days since running the 2013 Gateway Outer Banks Marathon. Since this was a PR marathon for me, I would like to provide a short report on the course and experience. Outer Banks (OBX) Marathon offers beauty, history, and pockets of sincere crowd support. This year the race was capped at 2,500 runners; something I understood later along the course. Just in front of me, in the elite corral, I offered support to Dalena Custer and Bill Shires, two strong runners from Charlotte who I train with. They took off a minute before the rest of the marathoners, fading around the bend. As the race director counted down, I took a couple deep breaths and mentally prepared for a few hours on my feet. Miles 1-6 were relaxing on winding two lane roads. I settled into my target pace of 6:36, hoping to group up with other runners around the same split. Unfortunately, that never happened and I relied on the crowd as running partners. Miles 6-12 warmed up with sunshine and historical flight. Passing by the famous Wright Brother Monument allowed you to shift focus, enjoying the beauty where the first flight took place. Surprisingly my wife had staked out a spot around mile 8.5, bringing an instant smile to my face. With my pace still on target, things were going pretty well before starting the Nags Head Woods Nature Preserve at mile 10. Miles 12-18 brought back memories of running junior varsity cross country. After two miles on hard packed gravel and sand, the course took a sharp left up a hill onto a narrow trail. I caught a pack of three runners; Natalie Hall, Jim Warrenfeltz (author of Runner’s World article: Race Recap: The Outer Banks Marathon), and Martin Thorne. Martin and Jim let me glide by and when the course returned to the road, I hung with Natalie for a bit. Jim caught back up a mile later and we enjoyed talking before I pulled away. Hindsight, I should have stayed with good company! Miles 18-21 were flat and fast. Around mile 20 my wife was there to greet me with a gel and supporting words. Continuing around 6:36 pace, I could feel my legs getting heavy. Miles 22-26.2, welcome to survival mode. A combination of wind (headwind at 8 mph) and fatigue hit me like a ton of bricks around mile 22. My pace slowed to low 7 minute miles. Natalie breezed past me, offering some kind words that gave me strength. I made it over the bridge and passed mile 24 cranking out high 7 minute pace. Jim passed me and then I realized that I had just over a mile left. Cruising in to the finish felt great, an inexpressible feeling of accomplishment that all runners love. OBX was my 4th marathon, giving me a new PR of 2:58:45. My time was a bit slower than goal, however I was pleased with the result. 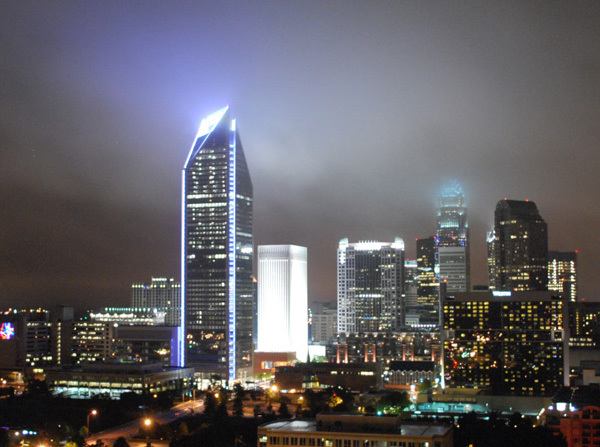 There was a lot of buzz in the Charlotte running community leading up to the race. 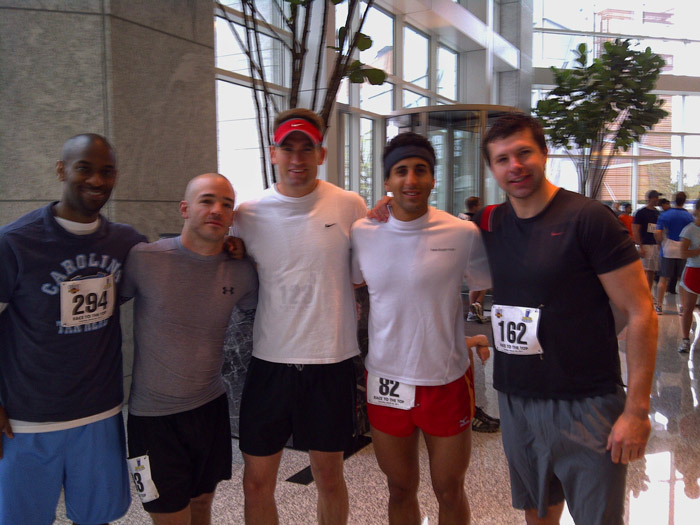 Participants were to race to the top of the Duke Energy Center’s 49th floor, divided into flights based upon their chosen experience level. Climbers started in 15 second waves to reduce congestion, while allowing for an optimal climbing environment. The energy at the start of the race was amazing. Everyone shared the same thought; how is this going to go? Participants talked, shared strategies and discussed the fact that today we were all setting the bar for next year. Flight 1 started promptly at 9:00 am. I nestled myself somewhere in the middle of the 50 climber flight. Walking up to the entry door, a calm feeling came over my body…no nervous energy; instead I would compare the feeling to bliss. After a 15 second count down, I was instructed to go. The rest went by very quickly; focus immediately shifted to my feet and breathing. My strategy was bounding, with an explosion from each right turn. At floor 34, I grabbed a much needed sip of water (your mouth becomes very dry in a stairwell), and pushed the last few flights to complete just under 8 minutes, 7:58 to be exact. 49 floors, no problem! This post race report would not be complete without calling out a few other local friends that participated. 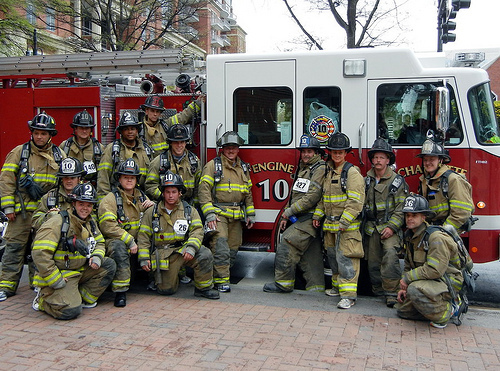 In addition, I would like to highlight the 16 Charlotte Firefighters that competed in full gear! 2. More air in the stairwell. Breathing was a challenge, the oxygen was heavy and post-race my lungs felt congested, a few other participants shared this same concern. The event was well executed by the Charlotte Sports Commission, and I would like to thank all the volunteers that supported all climbers.